A round trip bus tour for craft beer and music fans is running from Ottawa to Vankleek Hill this Saturday, March 10, for those who want to try a new beer from Beau’s All Natural and enjoy a show by Ottawa band The HILOTRONS as a warm-up celebration for St. Patrick’s Day. The tour is to celebrate the release of Strong Patrick, a new St.-Patrick’s-Day-themed Irish Red Ale that will be available for sale beginning this coming Thursday (March 8). The bus package includes return transportation from Ottawa to Vankleek Hill, admission to The HILOTRONS show at the Windsor Tavern in Vankleek Hill, a steak dinner, a Beau’s brewery tour, and a glass of beer (keep the glass), all for $35. The new beer for St Patrick’s Day is a strong (6.7% abv) interpretation of an Irish Red Ale. Part of the batch has been aged in wheat whiskey barrels, and then reintroduced adding subtle wood and vanilla nuances. The style is typically lightly hopped, well rounded and balanced, with a pleasant toasted malt character. 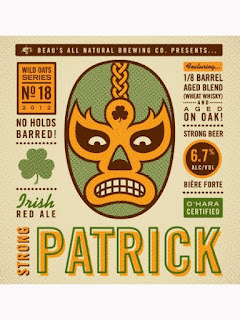 Strong Patrick is a celebration of the traditional style just in time for the upcoming Irish holiday. Brewmaster Matthew O’Hara describes the beer as a luscious, red hued ale with a malty backbone, showcasing toasty and toffee notes complemented by some warming alcohol & whiskey flavours. These combine with underlying wood & vanilla nuances added through contact with oak. He suggests pairing it with creme brulee, and of course some traditional soda bread and Irish stew. Strong Patrick will also pair well with steak dinner as the Windsor Tavern plays host to Ottawa’s The HILOTRONS to celebrate the release. The HILOTRONS will be performing their brand new live film & music project at the Windsor Tavern. This unique project has the HILOTRONS performing a score they've composed to go along with Ontario silent films from the 'Library and Archives Canada' vault. These films have rarely-if-ever been seen since the 20s/30s and will be playing alongside the HILOTRONS performance. More details are available at www.beaus.ca on the events page. Tickets will also be sold at the door for local attendees. Presales of Strong Patrick have already begun online at www.bybo.ca. A 2,500 bottle limited release, the beer will be sold direct from the brewery or online only, in 600 ml bottles for $7.95 incl. tax and deposit. It will also be served on tap for St. Patty’s Day celebrations at restaurants and pubs across Ontario.